So, you want to learn how to write, eh? Good. I suppose the best place to start is with an idea. After all, we can't have a critter like you running off with the keyboard and typing random nonsense, now can we? What's that? I called you a critter? As this is the first addition to my hub, perhaps I should explain myself. You see, critters are those folks learning to become authors. It's an affectionate term for those kindred spirits seeking to release their inner turmoil on white pieces of paper, with the hopes others will read them. So, what does this have to do with great story ideas? Not a darned thing, so we'll need to move onto the good stuff. I just wanted to get that part out of the way before continuing any further. With that said, we need ideas. Where do we get those? Relax, critter, it's a rhetorical question, and one that's far easier to answer than you could imagine. Two magic words – 'What If'. That's all you need, right? Good, because I'm ready to move on. Hmm… I see the confusion in your eyes. Confusion is good. It means the gears behind those eyes are turning, trying to make sense of it all. It also means I'll need to explain things to help you get the jist of them. You seem like a fine critter to me, so I'd be happy to help. It seems like nothing, but it's the basis of all stories. These were all 'what ifs' in somebody's mind before they were stories. The secret is coming up with a good what if. I see your mind starving to get in on the action, so let's feed it a bit, eh? Let me lengthen the 'what if' to help you out a bit. What if (something interesting happens) (that helps the main character accomplish something)? What if (a scientist creates a tear in apace that allows people to travel instantly across the galaxy) (and we become friends with the aliens we meet)? All you need is a spark to get started, and this simple formula helps arrive at that spark. Understand critter, there are as many formulas for finding an idea as there are people looking for them, but this is the easiest method ole Yoshi has come across, and trust me … it works. Why? You may ask. I didn't want to bore you with the details, but if I must … You see, we all want to read stories where interesting things happen and we all want to see stories where something gets accomplished before the story ends. By placing this all in your 'What If', you have fashioned the bookends to your story. You have a beginning (something interesting happens) and an ending (the main character accomplishes something). The rest is all the writing that is done in-between. He discovers a new world. Now, let me stop you here before you laugh at the simplicity. Remember … We're mining for nuggets – not writing a full-fledged story. Trust me, critter, you can spend a whole day looking at a blank page or you can go along with the seemingly insane to see where it will take you. See things my way and that page won't be empty when the sun falls below the horizon, provided it does rise again the next day. Just go with it, winding yourself toward the ending we planned for ourselves. Never take the straight path! Never, ever, ever… Take your time reaching the end and plan for twists and curves along the way. You're not writing a story, you're plotting the path for a road you will travel – when you are done musing away. Did you finally reach the end of the road? Good. So, now what? Another rhetorical question. You can expect those from time to time. It helps to keep a critter like you reminded of the fact they are here to learn and not to get lost in Yoshi's endless musings. Where was I? Oh, right. So, now what? Now we look at our page (or pages, with any hope) and sift through it for nuggets. What works for you? What doesn't? If you don't like pieces of what you wrote, cross them off. No sense in writing what your heart don’t want to write, right? With that done, look over at what remains. A picture should start to form in your mind of the story you want to write. It's still primitive and evolving, but we're only here for the idea. The how-to-write-it part comes later. 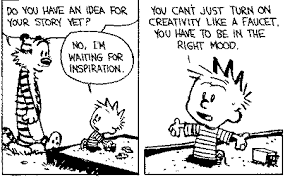 For now, you have an idea – an idea that must be written! Embrace the pages you typed, critter, as they are a creation only you can mold to pure gold, and we will go over how that's done in later.